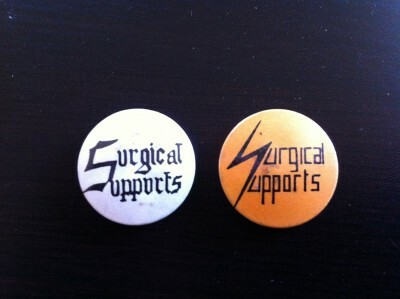 The Surgical Supports played great gigs around South Manchester in the early 80's with their mix of punk covers and originals. I picked up these 2 button badges at a church hall gig of theirs in Altrincham in 1981. They smashed it and we all left happily drenched with sweat and spit. Pleased to see that they're still going - there are a couple of YouTube vids floating around from 1993 and 2011 that are worth checking out. saw them at Timperley Cricket Club late last year (2012), still going strong!